intialize a 'struct timespec' from a 'struct timeval'. Definition at line 44 of file util-time.h. A timeval with 32 bit fields. Used by the unified on disk file format. Definition at line 211 of file util-time.c. Definition at line 179 of file util-time.c. Referenced by OutputJsonRegister(), SCProfilingRulesGlobalInit(), and SCProfilingSghsGlobalInit(). Definition at line 237 of file util-time.c. References CreateTimeString(), likely, SCLocalTime(), str, and ts. Referenced by AlertFastLogger(), CreateTimeString(), and TLSGetIPInformations(). Definition at line 195 of file util-time.c. Get seconds until a time unit changes. str String containing time type (minute, hour, etc). Definition at line 589 of file util-time.c. Definition at line 232 of file util-time.c. Referenced by CreateIsoTimeString(), CreateTimeString(), LogCustomFormatWriteTimestamp(), SCGetSecondsUntil(), SCProfilingKeywordsGlobalInit(), SCProfilingPrefilterGlobalInit(), SCProfilingRulesGlobalInit(), SCProfilingSghsGlobalInit(), SCTimeToStringPattern(), SetupFPAnalyzer(), and SetupRuleAnalyzer(). This function is based on: http://www.catb.org/esr/time-programming (released to the public domain). tp Pointer to broken-down time. Definition at line 410 of file util-time.c. Parse string containing time size (1m, 1h, etc). Definition at line 538 of file util-time.c. Parse a date string based on specified patterns. This function is based on GNU C library getdate. string Date string to parse. patterns String array containing patterns. num_patterns Number of patterns to check. Definition at line 453 of file util-time.c. Definition at line 607 of file util-time.c. Referenced by PcapDetermineDirectoryOrFile(), PcapDirectoryDispatch(), and RunModeUnixSocketGetDefaultMode(). Convert epoch time to string pattern. This function converts epoch time to a string based on a pattern. size Size of allocated string. Definition at line 509 of file util-time.c. References SCLocalTime(), strlcpy(), and unlikely. Definition at line 77 of file util-time.c. Definition at line 138 of file util-time.c. References RunmodeIsUnittests(), SCLogDebug, SCSpinLock, SCSpinUnlock, TmreadsGetMinimalTimestamp(), TRUE, and unlikely. Referenced by DetectDetectionFilterRegister(), DetectThresholdRegister(), NoWinDivertSupportExit(), SCThresholdConfParseFile(), TagTimeoutCheck(), TimeSetIncrementTime(), TmModuleDecodePcapRegister(), TmModuleFlowRecyclerRegister(), Unified2AlertInitCtx(), UnixSocketPcapFile(), UTHBuildPacketIPV6Real(), and UTHBuildPacketReal(). Definition at line 69 of file util-time.c. Definition at line 94 of file util-time.c. Definition at line 82 of file util-time.c. 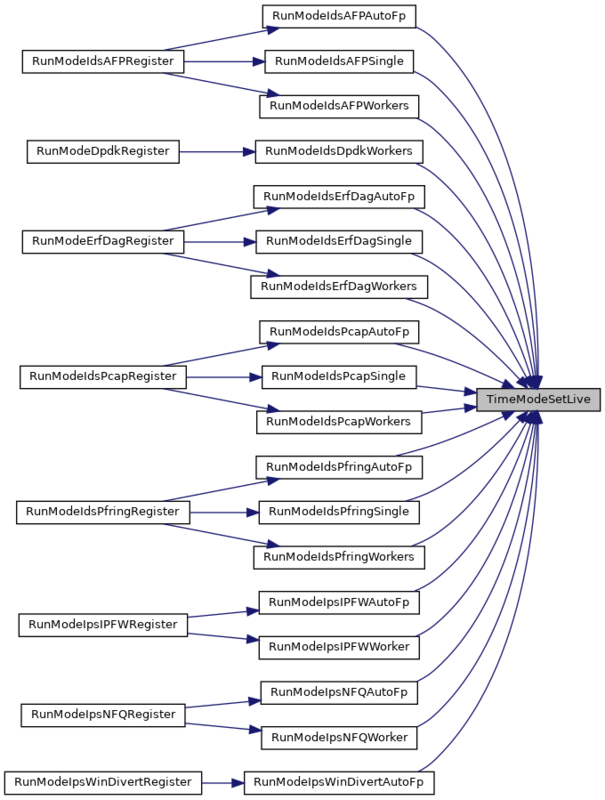 Referenced by RunModeIdsAFPAutoFp(), RunModeIdsAFPSingle(), RunModeIdsAFPWorkers(), RunModeIdsErfDagAutoFp(), RunModeIdsErfDagSingle(), RunModeIdsErfDagWorkers(), RunModeIdsNetmapAutoFp(), RunModeIdsNetmapSingle(), RunModeIdsNetmapWorkers(), RunModeIdsNflogAutoFp(), RunModeIdsNflogSingle(), RunModeIdsNflogWorkers(), RunModeIdsPcapAutoFp(), RunModeIdsPcapSingle(), RunModeIdsPcapWorkers(), RunModeIdsPfringAutoFp(), RunModeIdsPfringSingle(), RunModeIdsPfringWorkers(), RunModeIpsIPFWAutoFp(), RunModeIpsIPFWWorker(), RunModeIpsNFQAutoFp(), RunModeIpsNFQWorker(), RunModeIpsWinDivertAutoFp(), and RunModeNapatechRegister(). Definition at line 88 of file util-time.c. Referenced by RunModeErfFileAutoFp(), RunModeErfFileSingle(), RunModeFilePcapAutoFp(), RunModeFilePcapSingle(), and UtRunTests(). Definition at line 108 of file util-time.c. References SCLogDebug, SCSpinLock, SCSpinUnlock, and TRUE. Referenced by TimeSetIncrementTime(), and TimeSetToCurrentTime(). Definition at line 99 of file util-time.c. Definition at line 167 of file util-time.c. Referenced by DetectDetectionFilterRegister(), DetectThresholdRegister(), FlowUpdateState(), SCThresholdConfParseFile(), TagTimeoutCheck(), TmModuleFlowRecyclerRegister(), and Unified2AlertInitCtx(). Definition at line 127 of file util-time.c.